Click the stock to track shares of Priceline.com. The most expensive stock in the S&P 500 just got even pricier. 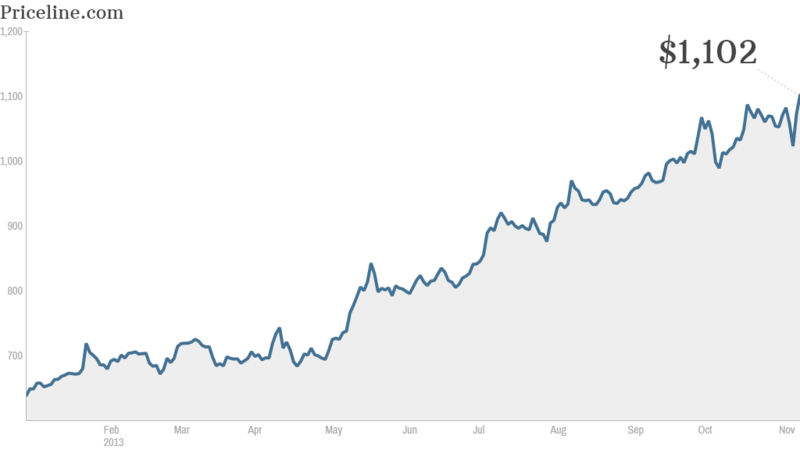 Shares of Priceline.com soared again Monday, rising to an all-time high above $1,100. In September, Priceline (PCLN) became the first S&P 500 company to hit a four-digit price. Google (GOOG) became the second to achieve the milestone last month. But Google is about 10% below Priceline newest peak of $1,109.50. Though Priceline is up nearly 80% so far this year, analysts remain bullish. The average price target on Wall Street stands above $1,200 per share, up another 10% from current levels. While Priceline shares are not cheap, they're not terribly overvalued either for being the leader in online travel. Shares are trading around 21 times 2014 earnings estimates. That makes it more expensive than rival Expedia (EXPE), but the stock is trading at a discount compared to Orbitz (OWW) and TripAdvisor (TRIP). Priceline's profits have been growing more than 50% on average for the past five years, with revenue increasing 30% on average. The stock has booked a fairly remarkable run-up during the past five years, too. Shares are up more than 2,300% since their October 2008 low . Priceline.com reported strong third-quarter earnings last week thanks to accelerating travel bookings growth for its flagship Priceline.com site. The company also has a booming international presence. Its Bookings.com site is an online travel leader in Europe. The company also owns Asian travel site Agoda.com. For 2013, analysts expect the company's profits and sales to climb 30% from a year ago. And they are predicting another 23% increase in earnings and revenue in 2014. Priceline is a bit of an unlikely stock to win the race to $1,000 a share -- despite being so well-known for its commercials featuring Star Trek's William Shatner as The Negotiator. Last year, many investors thought Apple (AAPL) would be the first stock in the S&P 500 to hit $1,000. Shares rose above $700 in September 2012 before pulling back. But now, Mastercard (MA), The Washington Post Co (WPO). and Chipotle (CMG) are all closer to $1,000 than Apple is.